The only species in this genus, Argyroneta aquatica, is also known as the water spider. It is a special spider because it lives in water. The scientific name of the spider, Argyroneta, means 'with a silvery net'. The silvery net is the air bubble that surrounds the spider, which it needs to breathe. Special hairs on the skin of the spider give it the ability to keep the air attached to its body. The spider has to go to the surface regularly to refresh the air. Argyroneta aquatica constructs a web under water and fills it with air. She catches air from the surface and releases the air bubble from her body with her legs. This is repeated until there is enough air in her 'diving bell'. Diffusion and oxygen bubbles released by the water plants also add air in the bubble. 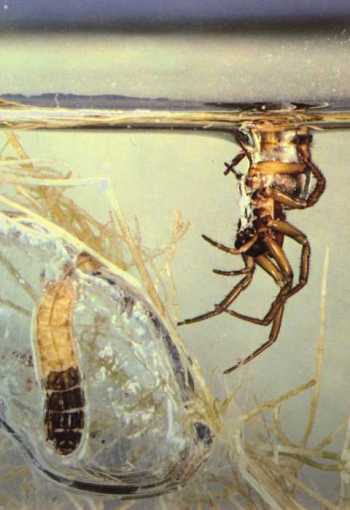 Prey is caught under water, killed by a poisonous bite and consumed in the air bubble in her web. The spider is a good hunter under water and swims quickly between the water plants. Change of skin is done outside the water or in a separate diving bell. There is hardly any foreplay before mating and male and female stay together for sometime. 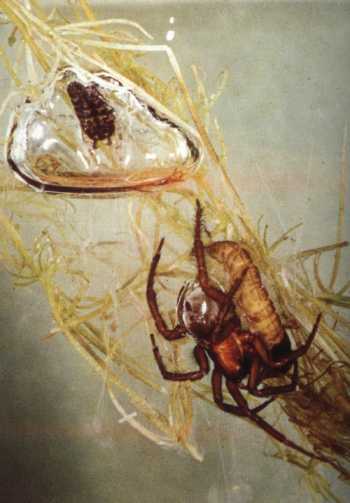 The eggs with the spiderlings are packed in a white sac in a separate air bubble in late spring or early summer. Late in autumn her nest is sealed and the spider stays there during wintertime. The male is 9-12 mm large and the female 8 -15 mm and both are light to dark yellow-brown. The spider can be found in vegetated, fresh, not running water. The bite of the spider is very annoying to humans and should be avoided.